Who doesn’t love free? Especially when it is the likes of Zynaptiq. Subspace takes elements from each reverb plugin and places them in one easy to use interface. All you have to do is sign up for their email newsletter. Hannover, May 26th, 2018: Zynaptiq announces the immediate availability of a new reverb plugin, SUBSPACE. Based on the allpass reverb module found in the acclaimed MORPH 2, WORMHOLE and ADAPTIVERB plugins, it features just two controls: a switch that selects one of four presets, and a dry-wet control. Adding (inter-)stellar reverb to your sound was never easier! 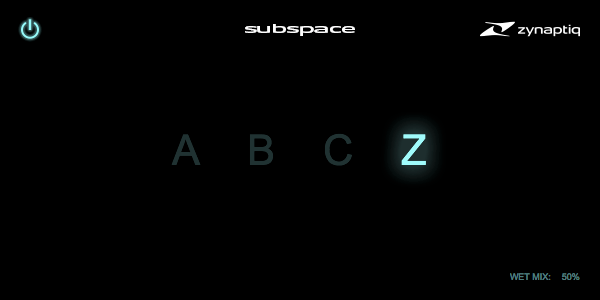 SUBSPACE is free and available exclusively to Zynaptiq newsletter subscribers. To get a copy, future users can simply opt in to Zynaptiq’s newsletter when downloading any update or trial installer from the Zynaptiq website – for example the trial for the advanced harmonic resynthesis reverb ADAPTIVERB – or when registering a purchased plugin. After opt-in, an email containing a confirmation link will be sent, and upon confirmation, a license and download URLs will be provided.